Yeah, yeah. I hear some of you are groaning & rolling your eyes, quietly telling yourselves, "Not another sequel again?". Just bear with me...this movie is worth every second of your precious time. This instalment is by far the best as compared to the first movie which is usually the best. Oh well, not that I remembered the 2nd & 3rd instalments anyway so it would be an unfair statement from me, eh? Anyhow, when a movie keeps your eyes glued to the screen without a hint of boredom means that the movie is pretty engaging. In this movie, Tom Cruise reprises his role as Ethan Hunt in prison while his team tries to help him escape. 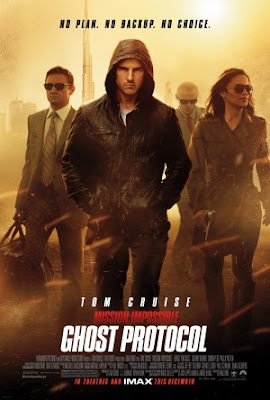 And then he takes on Ghost Protocol mission (hence the movie title) & embark on a journey around few countries. What's new compared to the previous Mission Impossibles? Definitely more gadget-laden than before. You get to see Ethan & his team incorporating iPhones & iPads in their operation, not to forget some of the state-of-the-art features that are probably fictional & non-existent in reality at this moment. And you get to see really cool concept cars too. I'd have to admit that the scene where Ethan Hunt was climbing the world's tallest building, Burj Dubai was exaggerated but nevertheless, the whole movie was witty & entertaining. That's what I like - keeping the plot straight forward & not trying too hard to be too intelligent or risk failing miserably.